New Jersey native Mara Justine, 15, appears on "American idol" on March 12, 2018. 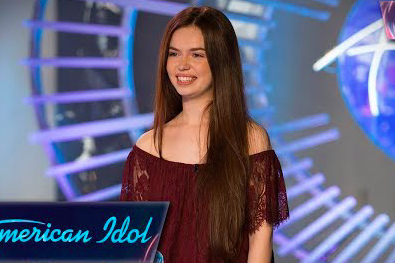 A 15-year-old South Jersey girl is younger than the "American Idol" series itself, but she was more than ready to face the music Monday night during the second half of ABC's two-part season premiere, a revival of the original Fox sensation. Mara Justine, a talented singer from Galloway Township, Atlantic County, appeared for her audition before Lionel Richie, Katy Perry and Luke Bryan — a daunting pop trio if there ever was one. Justine, who once appeared as a kid on "America's Got Talent" singing Perry's "Unconditionally," returned to reality TV with an impressive rendition of Rihanna's "Love on the Brain." She nailed it and blew the judges away. "I don't think we need to critique, I think we just need to vote," said Perry, whose counterparts stood up and helped punch Justine's Golden Ticket to the next round in Hollywood. Here's Justine's performance of "Unconditionally" on "America's Got Talent" in 2014.